It’s hard work being a foal. First off, after you are born, you don’t even get a meal until you stand. By the way, those legs you have to stand on can be nearly 90% the size of those on a full grown horse. You need those big legs because every day they have to support the additional two to three pounds you’ve grown. Then, of course, one has to play. It’s a big beautiful world you’ve been born into and, heck, they don’t call it “horsin’ around” for nothing. Somebody has to do it. Spring is in the air. There are the other colts and fillies to impress, food to eat, mares to trot beside, more food, dirt to roll in, maybe a snack, bugs everywhere, more food, and so on. Every now and then it does one good to fall down in the closest patch of green grass and spring blossoms and grab a little siesta. 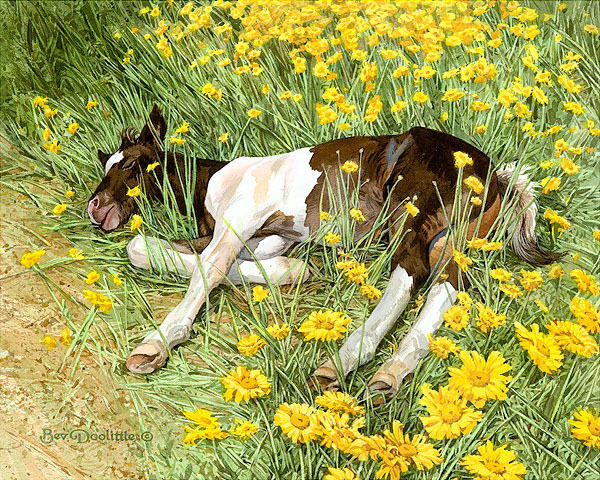 After all, it’s hard work being a foal. Bev's adorable new piece has been incredibly popular--it is already in low inventory. Place your orders soon to guarantee pricing and availability.